IMPORTANT: We recently digitised our registration process, meaning that we no longer user paper waiver forms. 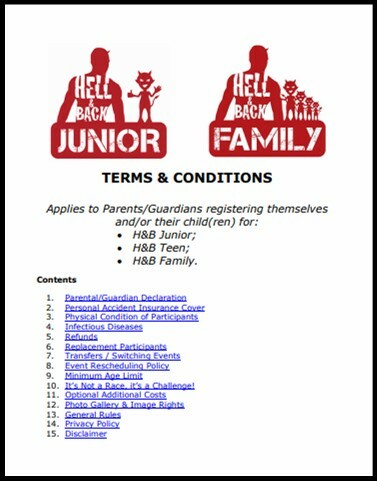 Instead, at the Registration Tent, one adult must electronically agree to the Terms & Conditions of Participation for each child looking to take part in HELL & BACK. So, if you are not travelling yourself to H&B at the weekend, make sure you have assigned an adult to sign it on your behalf. No child will be able to take part without an adult agreeing to the T&Cs. Once signed, each child will receive a numbered wristband, allowing them into the Starting Pen. You should bring your QR Code and your Ticket to help in case there are any issues with your child's registration.